With the growing popularity of virtual reality (VR), demand for 360 video production is also on the rise. Whether you run a video production company, you’re a marketer looking to create experiential brand content or you want to tap into the potential of VR for employee training, now is a great time to get the ball rolling on 360 video production. 360 video is immersive in nature, allowing the viewer to explore outside the frame and experience each story in a different way every time they view it. This immersive medium encourages viewers to explore. Compared to standard video, 360 videos can command more earned interactions, increase retention and have a lasting impact. As VR reaches mainstream adoption, the 360 video viewing audience grows larger and larger. IDC forecasts 43 million VR headsets shipping annually by 2022. The price of VR headsets, such as the Samsung Gear VR, have come down significantly since early models were released, and new headsets are making it easier for consumers to afford and discover VR as first-time users. Users can watch 360 video on any capable mobile device, with or without a VR headset. Viewers can simply move their phones to explore the 360 content, like a window to another world. It’s just as easy to view content on laptop and desktop computers, where you can click and drag to change the perspective of the 360 scene. The content can easily be adapted to all platforms and devices — it’s easy to shoot once and deploy to various platforms and devices. Tethered VR headsets and powerful computers are not required. 360 cameras have become more affordable and easier to use at the consumer level. It’s easier than ever to shoot and stitch 360 footage with inexpensive entry-level cameras like the Samsung Gear 360. On the professional level, there are turnkey solutions for cinematic quality 360 video with bundled software for stitching and live streaming. Today’s 360 cameras give you the ability to live monitor everything you shoot, just as you would with a traditional video camera. Many of the top production software companies are jumping on the VR bandwagon by offering solutions for editing and applying effects to 360 video footage. VR support has come with offerings from Adobe, Final Cut, Foundry and Blackmagic Design, to name a few. Many of these tools are capable of working in both monoscopic and stereoscopic VR footage. There is also growing support from visual effects plugin makers for rotoscoping and compositing 360 video. Everything you need to start creating 360 video, from pre-production to post and distribution. Professional grade 360 cameras like the Samsung 360 Round include full-featured software suites to guide every step of the creative process, from import, to stitching, to live broadcast. Many of these cameras can easily be added to existing production workflow with Ethernet and SDI connections. For destination marketing, 360 video and VR can take experiential marketing to the next level. This new medium is transportive, giving your viewer the next best experience to actually being there. Whether you aim to book vacations, find that perfect summer rental, or explore new and exciting tourist destinations, 360 video can take you there. 360 video can create immersive and distraction-free environments for trainees. Businesses in various industries can bring VR training to learners anywhere in the world, without the need for additional travel and personnel costs. Organizations can also eliminate risk by allowing learners to experience tasks before trying them in the real world. There’s no better way to be transparent with your clients, shareholders and investors than to create facility tours in 360 video for VR. 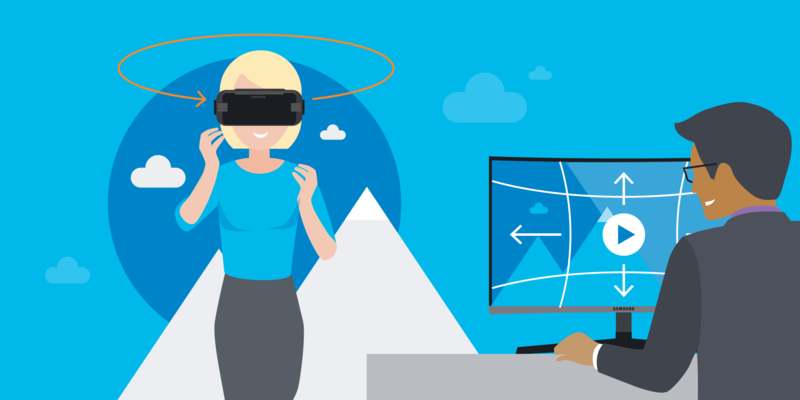 Corporate offices can dazzle new prospective hires with VR experiences in company culture. Potential buyers from all over the world can tour commercial properties without having to get on a plane. Showing your state-of-the-art manufacturing facility in 360 video can help to persuade those clients who are on the fence. Advanced VR cameras like the Samsung 360 Round let you livestream immersive 3D 360 video in real-time, in 4K per eye resolution with minimal latency. You can broadcast directly to platforms like Samsung VR, YouTube, Facebook or through your own media servers. Without a doubt, 360 video can be useful for just about every type of industry, and it’s one of the easiest ways for your organization to join the cutting edge. If you’re ready to begin producing content for this popular new medium, the time to start is now. Ready to start creating content — or just curious to learn more? Download our free Ultimate Guide to 360 Video Production.